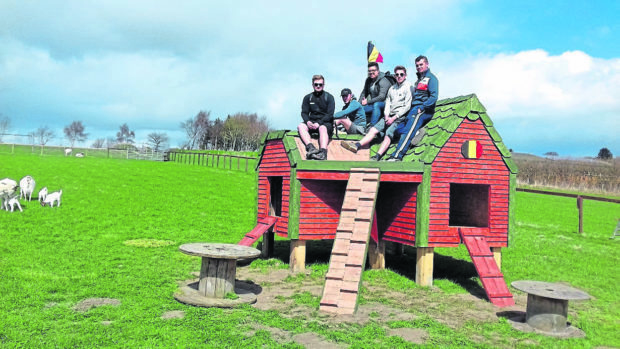 Students from Belgium with their completed goat mountain at Cantraybridge College. Seven students from Cantraybridge College in Inverness have experienced a taste of working life in Belgium. Funding has allowed them to take part in a two-week Erasmus+ programme. It has given the students from Scotland’s unique further education college for young adults with additional support needs the opportunity to live and work abroad, building vital skills and increasing self-confidence. Six students undertook work experience in painting and decorating within schools, children’s clubs and businesses in the Antwerp area, with an additional student interested in an equine career learning the ropes and reins at a stables in Manege den Dries. The reciprocal exchange programme also saw eight students from Belgium arrive in Inverness to take part in varied work programmes, including retail experience with MacGregor Industrial Supplies and Oxfam, wood skills from Cantraybridge’s Wood Skills Training Centre, property maintenance and horticulture.